Attention to detail was key in this game, as this was one of the biggest released of 2009, if not the decade. About four different version of the game were released: Standard, Hardened, Veteran, and Prestige. For the purpose of this review, I am reviewing only the Standard edition, as the other edition came with trinkets and gadgets that are not normally associated with normal packs. Even so, the game itself was nicely packaged and presentable. In game, the set-up proved to be simple but effective, which was surprising for a game of this magnitude. Game option are clearly defined in the menus, and spread across neatly. Loading between scenes and saves were not a problem, as they proved to be fast and transitioned with ease. No real lag issues, as it is very common it First Person Shooters when dealing with explosions and movements. The game’s story follows the previous installment, “Call of Duty 4”, and again splits the story between two protagonists, a U.S Ranger and “Task Force 141” soldier Gary “Roach” Sanderson. The game also has former protagonist, “Soap” MacTavish in the game as the superior of Roach. Without going into detail, the Campaign storyline was filled with twists and turns, but ultimately left a lot of unanswered questions by games end (possibly to leave open for the third Modern Warfare game). It tried to emulate the same shock value it gave in the previous installment, which worked to some degree. Nevertheless, it just couldn’t top what was done in Call of Duty 4. Overall, the campaign story should have been presented better, as much of the plot proved to be convoluted and confusing. New engines used by Infinity Ward, IW 4.0, proved to be beyond its predecessor. The environment is more crisp than CoD4, but some parts of the environment were a bit fuzz and could use improvement. The details in objects and characters is much better than the previous game, as they got the texture in the uniforms and most vehicles spot-on. Overall visuals are ahead of the curve, as the sites of the game almost feel as if you were part of the world itself. Fast frame rate made the game much more enjoyable, as it was meshed in with the quickness of the game. No major technical issues in the game, making it sound all around. Great voice acting from the likes of Keith David, Lance Henriksen, and Billy Murray. Sound effects, from gunfire to walking were used appropriately and effectively. The game soundtrack produced some great music, especially music in the Rio de Janeiro, but also had some music that felt flat or bland. 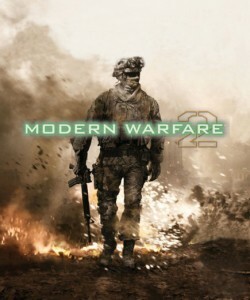 “Modern Warfare 2” has three different gameplay modes: Campaign, Special Ops, and Multiplayer. The campaign mode, like previous CoD games, is filled with action. Enemy AI proved to be smarter and the game itself mostly did away with infinite re-spawn points for the enemy, which make the game more bearable. Navigation in this game is made easy and friendly, as destinations and friendly AI are always marked for you to follow. Overall, it proved to be solid, but it hadn’t really evolved or improved itself from the previous installment. It actually was shorter (which really didn’t bother me, but did many), and lacked the awesomeness CoD4 had (the gunship level). Still, you can’t say anything overly negative about campaign, as it still proved to be fun. I was disappointed that the game didn’t have a “Campaign Co-Op” mode, but the game redeemed itself with “Special Ops” mode. This mode can be played with another person, split-screen or online, or just plain solo. The Special Ops mode is, interestingly enough, longer than the campaign mode and is filled with missions that include some from the previous Modern Warfare game. It is a mode that people of Co-op should play, because it proves to be an all around fun fest. The only problem I saw with Special Ops, was the fact that in you wanted to play with someone online, they had to be on your friends list, which is something I didn’t really like. Despite this downside, special ops exceeded my expectations. The last and final mode is “Multiplayer”. This mode is the key and staple of Modern Warfare 2, as it was done with incredible detail and with numerous game modes. It also introduced a 3rd person mode in the multiplayer, something that was an extreme surprise considering what genre CoD represents. There is something for everyone in this mode, and that in itself is grand. Game mechanics are excellent in this game, giving you several presets in the option menu to fit your style of control. I’m still disappointed that they don’t have a “custom” selection when it comes to assigning your own controls, but I won’t count it down for this game. It is the basic shooter controls, but you would be surprised how many companies fail at this simple concept. Overall function is fast and responsive, giving the player a feel of complete control in the game. Most of the buttons serve a purpose, and none of them are wasted in a fashion that would make the game more complex than what it should be. Modern Warfare 2 is a game that will last you, if not for the Campaign or Special Ops, but definitely for the Multiplayer. With many different modes online, you will be stuck to your seat playing each mode from “Headquarters” to the classic “Free-For-All”. To say it simply, this game was meant to be played online. Modern Warfare 2 proved the hype it was said about, and proved to be a delight in 2009. There may have been some minor setback that I could say hold the game back from getting a higher score, but you can not doubt how well this game was done nor how much fun you’ll have once you pick up a copy. The Good: Overall Gameplay, Graphics, Multiplayer. This entry was posted	on Wednesday, February 17th, 2010 at 7:40 PM	and is filed under . You can follow any responses to this entry through the RSS 2.0 feed. You can leave a response, or trackback from your own site.